a glimpse of our life: Book review: Imagination Station books 3 and 4 and a giveaway! Book review: Imagination Station books 3 and 4 and a giveaway! Our children have enjoyed the Adventures in Odyssey DVD series, so I was delighted with the opportunity to review books 3 and 4 in this new series. Peril in the Palace and Revenge of the Red Knight continue the series, but are understandable read out of order. There is a continued thread of mystery throughout the series. Following the successful launch in March of the first two titles in the Imagination Station series, Adventures in Odyssey’s Mr. Whittaker and his two young friends return for all-new adventures in Peril in the Palace and Revenge of the Red Knight, both scheduled to release in May from Tyndale House Publishers and Focus on the Family. 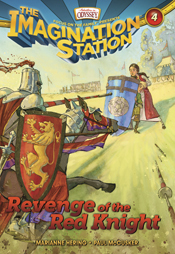 Alongside cousins Patrick and Beth, young readers board the Imagination Station and travel back in time to China in 1271 where they come face-to-face with Marco Polo and step into the throne room of Kublai Khan, before finding themselves transported to 1450 England to witness a jousting battle they won’t soon forget. Written for ages seven and up, the series features the virtual reality device the Imagination Station, which is one of the major plot devices used in the Odyssey audio drama series. Nobody knows the inner workings of the mysterious device, invented by Mr. Whittaker, but with a push of a button, it launches users back in time to experience historical events in-person. In Peril in the Palace, cousins Patrick and Beth are kidnapped by Mongol warriors. Saved from harm by fellow traveler Marco Polo, they are brought to the Mongol palace, where the Kublai Khan dislikes both their gifts and their message about Christianity. The adventures continue in Revenge of the Red Knight, where Patrick and Beth find themselves immersed in the War of the Roses in England." They also shared that the series is going to be expanded to 12 books! Disclaimer: I was given this set of 2 books for the purpose of this review. To enter, leave a comment. 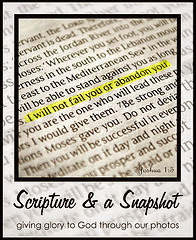 For an extra entry, follow my blog or tell me that you already do, leave a comment either way. I'll choose one winner with random.org on Wed. August 17th. Be sure to leave your e-mail address so I can share it with the publisher if you win. What homeschool mom wouldn't want free books?! I'd love a chance to win. I'm already a follower too! Would love to win this for my grand kids. My son would LOVE this! :) Thanks for the opportunity to win!! These look great--my son would enjoy them. I think Jenner would love these books. The winner is Tracy! Random.org picked #5. Thank you all for participating. Be sure to go check out my current giveaway.